All automotive locksmith experts at our company work thoroughly in order to eliminate current problems related to either the car's locks or keys. We proudly have specialists in car locks at Locksmith Houston and offer services 24/7. We can help our clients anytime and the time of our response is fast. Having the perfect infrastructures is of the essence in our job. We do own amazing equipment of the last generation and do work with knowledgeable technicians. 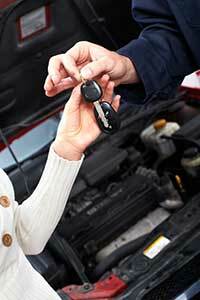 Such parameters are not just helpful but also necessary when we offer auto locksmith service. They determine our speed and the quality of our work and that's why every one of our customers can be sure of our efficiency and quick response. Our car locksmith specialists have vehicle security systems expertise. We are all familiar with the peculiarities and special characteristics of all car makes and their security systems. We know how the transponder key communicates with the central system of the car and that's why we know how to fix related problems. It's no wonder why every single van of Locksmith Houston is equipped with state of the art machinery. Car security locks and keys often require computerized methods for repairs. By having the right equipment in our trucks, we are able to fix conflicts, reactivate the chip key and replace the lost ignition keys. We make intense preparations as far as our infrastructure and expertise are concerned so that we can be ready to assist you properly. New keys must be cut perfectly and problems must be fixed with precision. All technicians of our business are trained and true lock repair experts. When there is need for repairs or it's crucial to change the locks of the vehicle, you can count on our expertise. You can also rely on our quick response. There is a reason why we have a mobile team. When people are locked out of their cars or do not have access to their vehicle due to key problems, we ought to help them fast so that their security and the security of their car won't be jeopardized. You can have peace of mind when you work with our company. We provide auto lockout service 24/7 and guarantee that one of our technicians will be there in just a short time. We also open trunks, take care of damaged locks and make sure all relative issues are handled the right way and right away. Don't hesitate to give us a call if your car keys are lost or need to ask questions! You can also email us!